A crooked mechanic and an eBay seller illegally repaired written off top of the range BMWs and then sold the deadly motors on to unsuspecting buyers. The ‘car ringing’ gang bought cars that should have been crushed and using stolen parts repaired them to put the unsafe motors back on the road. The cars had suffered crashes which affected the crumple zones of the cars but the pair carried out “superficial” cosmetic repairs and endangered the lives of new buyers if they ever have an accident. Some had their fronts totally caved in while others suffered side impacts damaging the central pillars which would protect occupants if the car rolled. They even made replicas of high performance BMW 1Ms using parts from three of just four of the limited edition models stolen in the UK. They exploited loopholes in the system and then hid the true history of the cars including clocking the mileage to fleece seven buyers out of £100,000. But Sussex Police’s Serious Organised Crime Unit smashed Arran Khan’s eBay-based business ‘Affordable Performance’ and Imran Raja’s company, Customize Bodyworkz in Three Bridges, Crawley. Raja, 38, was jailed for 42 months and Khan, 28, was jailed for 46 months for conspiracy to defraud after being convicted following a five-week trial at Hove Crown Court. Sentencing the pair on Tuesday Judge Christine Henson said the loss to the owners of the seven cars which formed the basis of the prosecution at between £90,000 and £100,000. Judge Henson added “both had the highest level of culpability in the fraud, which involved significant planning over a sustained period of time. “I consider it to be a real aggravating factor that the defendants were prepared to carry out cosmetic repairs with no consideration of the safety of the victims or other road users. 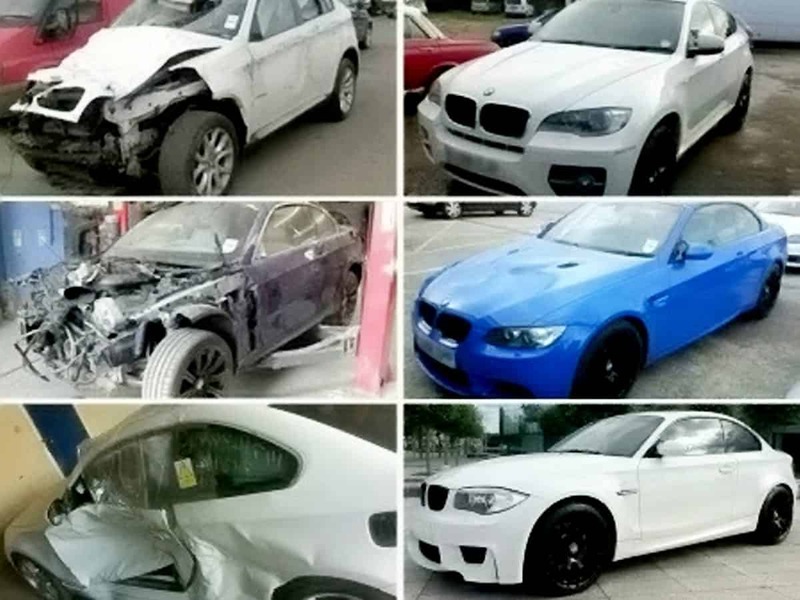 Detective Constable Nick Tinley said; “The defendants bought badly damaged and written off cars, mainly top of the range BMW’s, repaired them, often with stolen parts, and then sold them on. “The sales were fraudulent because the buyers were deceived as to the true previous history of the cars. “They should have their bodyshell crushed and should not go back on the road. “The defendants took advantage of then-existing procedural loop holes in the insurance and salvage industry processes, and the processes of VOSA and the DVLA to put a number of these vehicles back on the road. “Several vehicles were purchased for export using an account registered in Belgium. “These vehicles however did not leave the UK, instead they were acquired by the defendants and repaired in Crawley. “The defendants produced a number of replicas of the limited edition BMW 1M model. “Only four 1Ms have been stolen in the UK and the defendants were found to have handled parts from three of them. “Members of the public in the market for a second hand vehicle are advised to carry out diligent checks before making a purchase. Khalid Khan, 54, Jose Teixeira, 38, and Ian McMurray, 49, were found not guilty of conspiracy to defraud while Scott Bolger, 45, was found not guilty of perverting the course of justice.